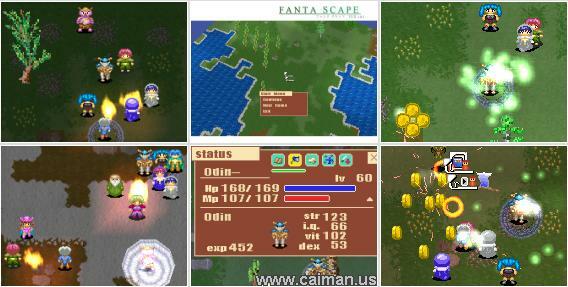 Caiman free games: Fanta Scape by KBZ. 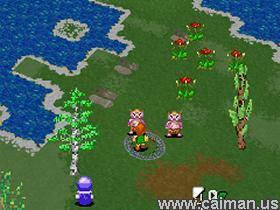 A big and great RPG / RTS game with 3D views from Japan. This wonderful game has many options and possibilities. You start with a small team of three characters (a fighter, a cleric and a wizard). 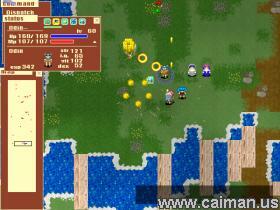 Your task is to destroy all the enemies on an island. To fight you can use your fighter and/or your wizard and you can heal them with your cleric (note: the cleric can also heal herself). There are 4 worlds to choose from: Island (easy), Plain (normal), Desert (hard) and Ruines (super hard). In each world you can play of number of levels. You can replay a level too, even if you completed that one before. You can do that to train new fighters or to earn more experience points or gold. Don't worry, even replaying a level is not boring, because each time you start a level it is another one (random created levels). In a few case it is possible that you cannot complete a level because the island are divided into several parts and you cannot reach all the enemies, but that's not a problem, just restart that level (in meanwhile you have extra points and gold). After completing (or cancelling) a level you can upgrade your characters and/or recrute some new ones. After playing a character will have some experience points (exp), so you can upgrade your character by clicking on "LvUp" (Level Up). With a higher level your character will be stronger (more Heal points (Hp) and more fightpower (Mp)). Or if you want to upgrade your character to another kind, you can click on ClassCng (Change Class). At this manner you can eg. change your fighter into a ninja, a knight or another man. Or your cleric into a witch, a scout or another woman. Click on Advertisement (cost 50 gold) and wait a bit. The people will be able to see a poster and if they are interessed, you will be able to recrute one or more fighters (men) and/or archers (women). If you really want them, don't forget to click on Employ. This costs some gold, but now you enlarged your army. The best way to upgrade your new soldier is to play an easy level to earn some experience points. After that you can upgrade your new soldier or change it into another kind of fighter, sorceress or whatever. Everything works with the mouse and is menu driven. The menu's are in English so there is no problem. - To select a character, click on it. - To let him/her move left or right click on the spot where he or she has to go. - To fight (to heal, etc..) just right click on the enemie (or on your friend in case of healing). - note: You can let one or more charcters follow another character. eg. Let your cleric heal the wizard, just click on the wizard and everywhere the wizard will go, the cleric will follow him and heal him automatically if necessary. Only remember that she will forget that task while they are sitting by a campfire. While playing a level you can switch over to a 3D screen. The game will continue and it is very nice to see it, but you are not able to select your characters anymore, so the 3D screen is only present for the show. You can only fight and move in the 2D screen. This is really a big game, I played it for several days before I could try to review it. It has so many possibilities! I hope that this review will be a big help by playing this great game, because the website and manual are in Japanese and as good as unusable, even after translating them.